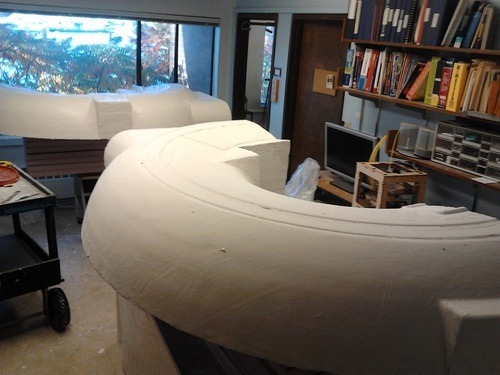 Giant Foam MRI at Metrix. If you have been to Metrix in the last few months, you have probably noticed the tiny bits of pink foam floating around and clinging to everything. They happened to be the byproduct of the largest fabrication project Metrix has worked on so far. It was a fun and experimental project that led us to get to know our biggest robot, the giant router, very well. Several months ago, Frederick “Fritz” Reitz wandered down the stairs into Metrix to find out more about all of our fabrication capabilities. 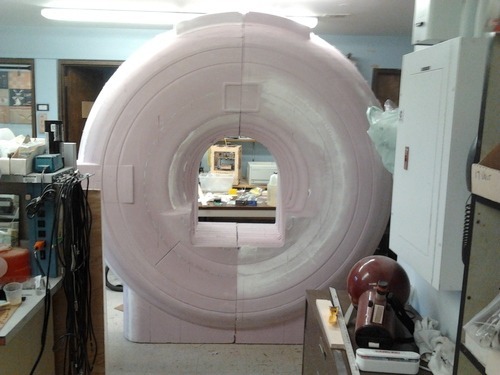 He needed a full-scale replica of an MRI machine. We certainly hadn’t done anything of that size but we love a good challenge so we took on the project. 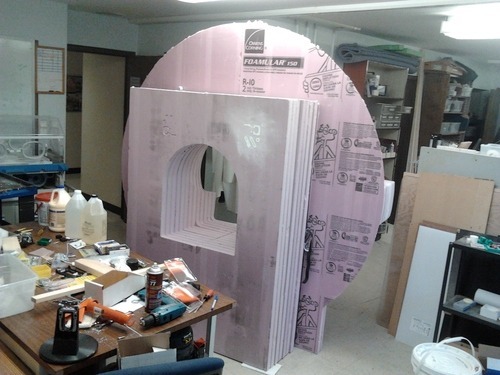 After much discussion, we chose to work with 2 inch thick, 4 ft by 8 ft sheets of rigid foam insulation. The material is great for shaping with the router because it is light, uniform, and can be easily finished with a bit of sandpaper. 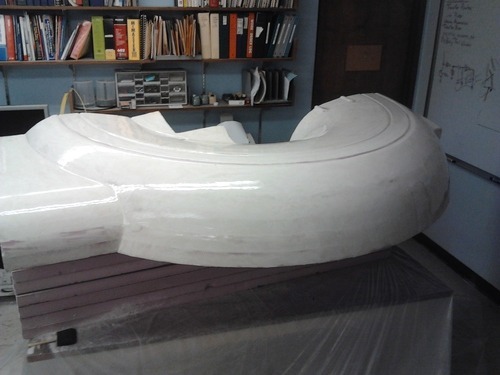 It provides a good structure for complex geometries that will need to get epoxied and painted. What made this project particularly exciting was that it had a pretty great real-life application.The replica was requested by Tom Grabowski, who is a professor of radiology & neurology at the University of Washington. His plan is to use it to get test subjects used to the machine off-line. Time on the real MRI is very expensive so this allows for refining testing teqniques and getting the subjects more comfortablewith the machine. He went to the Center for Human Development and Disability at the University of Washington for help on this. The Center is funded by a NIH grant to support research in human development and disability in such areas as autism, language acquisition, and cognitive development. The Center has their own Instrument Development Lab, where Fritz works. 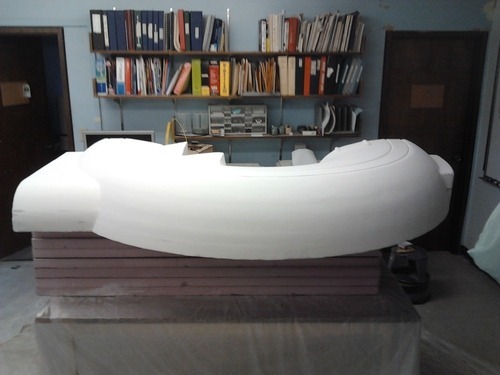 The Lab was tasked with the actual fabrication of the replica-MRI, which is what brought Fritz to Metrix. While his lab has many great tools for production, the scale of this particular project required outside help. 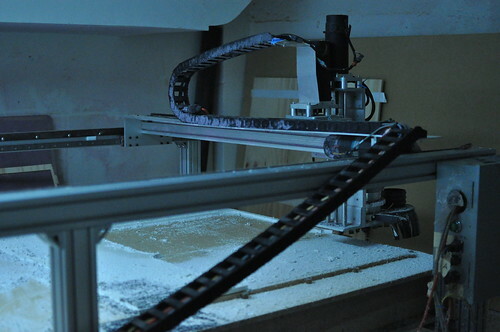 Our router has a 4 ft by 8 ft cut bed and the z axis has about 8 inches of variance depending on the cutting bit size. 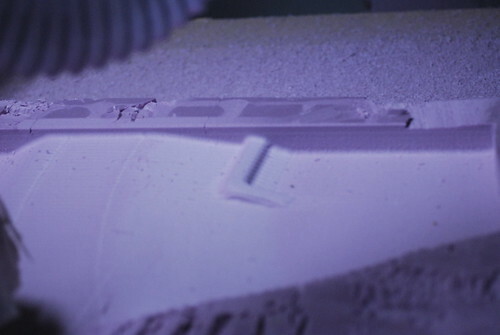 Since the project required a lot of complex geometry shaping we had to really learn the 3D z-cutting capabilities of the router, which was new for us so we looked forward to doing some testing. 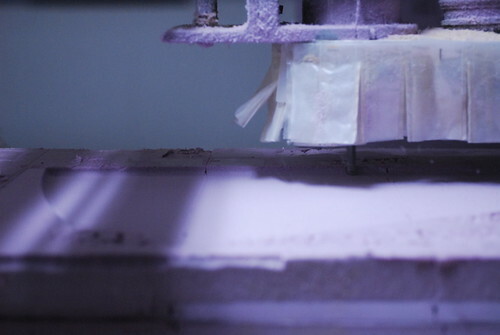 Below are the first test of the finished surface quality of the foam pieces. We had to use specialty bits designed for cutting foam and soft plastics. When working with something soft like foam, maintaining a very sharp cutting edge is essential in getting a smooth surface. Otherwise the finished surface ends up looking very rough and dented where larger bits of foam get pulled out. The nice thing about working with these specialty bits is that they are super sharp and come in extra-long options because the chip load with foam is quite low. Having the extra length gives much more flexibility in the z-depth shaping of a piece. In order to achieve a high degree of detail, first we ran a rough finishing pass using a 1/2” ball-end bit with a fairly large stepover. Then we used a 1/8” ball-end bit with a smaller stepover to do a finishing pass. The stepover is the amount the bit moves over with each pass and it is determined as a percentage of the bit diameter. The size of the stepover and the length of time it takes to finish a pass are inversely proportional. We went with a 50% stepover for the rought finishing pass and a 25% stepover for the final finishing pass with the small bit. Usually the roughing passes run faster to save time with the knowledge that the finishing pass will smooth everything out. The project took many weeks of testing, troubleshooting, buying more foam, calibrating the router, and calibrating the router some more. Our amazing new technician/pretengineer Seth Crowell is a master with the router. He has put many hours bringing the robot to the glorious life it was meant to have. Below is the raw assembled product standing full-height in the Instrument Development Lab. The front round piece is made up of a total of eight sections. Each half is assembled from four layers of various thickness. 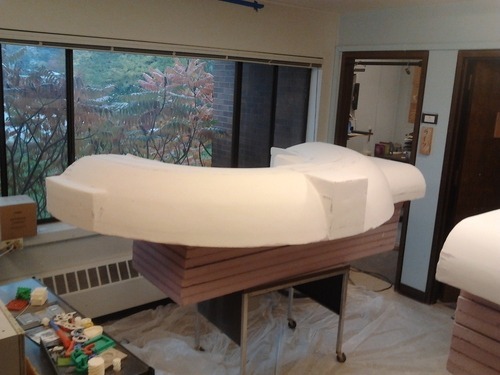 The back section, which subtly curves in to simulate the funnel of the MRI, is constructed from eight single layers of the foam. While all the pieces went through a rough finishing with the 1/2” bit and a final finishing with the 1/8” bit, the top two layers of the front part also required an additional initial roughing pass. The roughing pass was done with a 3/8” flat-end extra long bit. This pass is used with thicker pieces of material when the geometry requires deeper cuts. It removes the bulk of the material in order to make room for the rough finishing pass with the ball-end bit. The roughing generally happens in several set-z drops where each pass removes the extra material at a specified level, and the bit drops down another level for the next pass. The stepover for this can be set as high as 100%. The rought pass is generously off-set from the finished surface of the geometry so that any accidental gauging of the final piece can be avoided. The rough finishing pass with the large ball-end bit removes most of this excess material. While the roughing of a piece involves several fast passes, the rough finishing and final finishing are single, slower passes that trace the final surface of the geometry with increasing degrees of precision. Some initial patching with joint compound was necessary in order to smooth out any little dings from the routing and moving processes. The full piece stands 7 feet tall by 7 feet wide and about 3 feet deep. Once the pieces were assembled, Fritz embarked on the long and patient process of finishing the final product. First he applied an undiluted coat of drywall mud to fill in the assembly-joint seams and any dings. Then he smoothed out the surface of the pieces with a few coats of diluted finishing mud to get them ready for sanding and coating in plastic. The next step of the process was fine-sanding the pieces to give them an extra smooth finish. Once sanded, the pieces were ready for their shiny plastic coating. Fritz used a single coat of pour-on ultra-glo plastic for this part. As you can see, the pieces are looking more cohesive with each step. 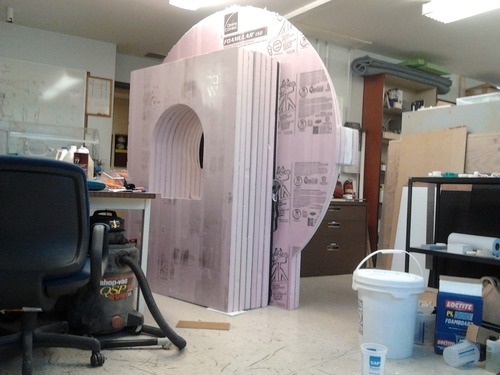 In the future of the giant foam MRI you can expect to see painting and perhaps even some sound and lights rigging. One of the great things about this project is that while it was requested by Professor Grabowski, many other researchers at the UW will be able to take advantage of the availablity of this tool. Metrix is very excited to have been part of not just this amazing challenge of lungs and maneuvering skills but also of the advancement of science. 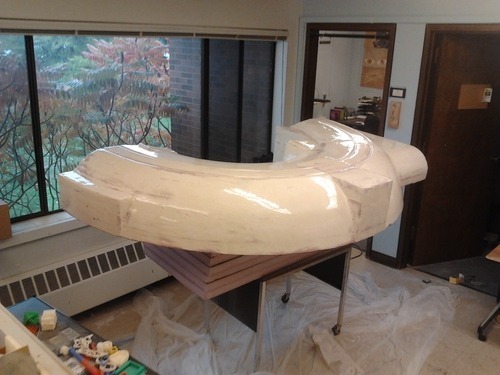 Stay tuned for updates on the finishing progress of the giant foam MRI!